I don't remember what it looked like originally, but my handy dandy mother cleaned it up, bought an "antiquing kit" and fixed it right up. If you are old enough you may remember antiquing kits. They contained an oil based colored paint and a dark stain that you applied rather like a glaze - the difference being that the stain streaked the entire piece heavily. The color my mother picked was an olive green. So think olive and black. It was really a nice finish for the time. This buffet sat in our dining area until my parents downsized around 1999 and gave the buffet to me. I always liked the buffet. 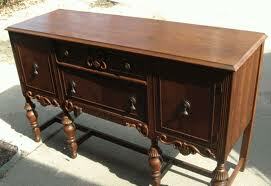 The top drawer spanned the width of the buffet and was about 4 inches deep. This was the adult junk drawer - containing not exactly junk but many small items that had no real home. I loved that drawer. I spent countless Saturday afternoons while my parents were out tending to the needs of our 7 person family, looking through and rearranging the items in this drawer. The number one thing I remember about the contents were the Kennedy half dollars that they kept there. These were a big deal at the time. 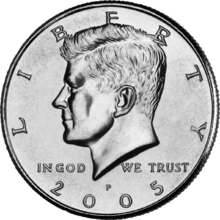 Kennedy half-dollars were minted immediately after the assassination and most importantly, 90% silver. That was a big deal so people hoarded them. Eventually they lowered the silver content to 40% and then 0%, but the first coins were somewhat valuable. I remember being pretty fascinated by these, and also remember pilfering a few of them when I was a few cents short for my beloved Scholastic Book order at school. But I digress. When the buffet became mine the first order of business was to cover up the green antiquing. I put down a crackle medium and then a pale cream color. The green was nice as the crackle highlight and it looked pretty good. The dining area of my home wasn't big enough for this piece of furniture, so I used it for a dresser in my bedroom. In another home it made it into the dining room. When we moved into our current home I had other furniture I wanted to use in the dining room, but needed something to hold my television so I decided to cut the legs off and use the top for the entertainment center and adapt the legs into a coffee table. The first order of business was to remove the layers of paint treatments on the piece. Getting those curves stripped wasn't easy! Three weeks and lots of chemicals later I had a clean, sanded, walnut finish. 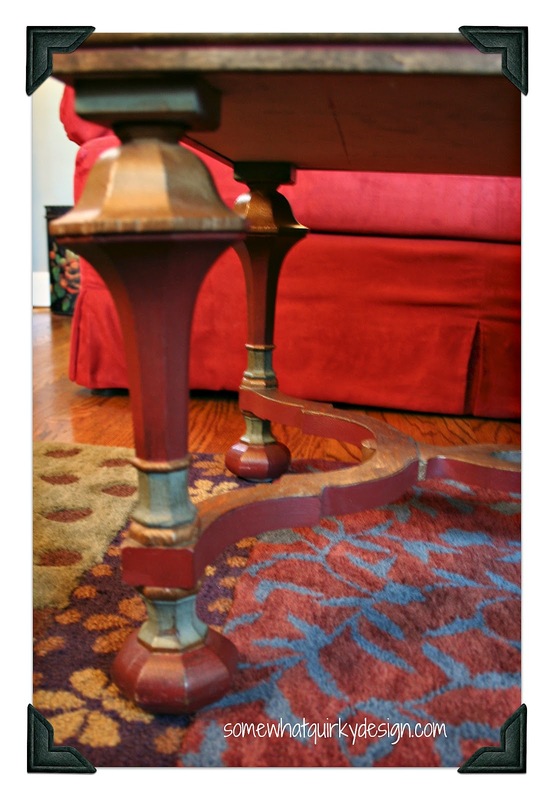 This piece is solid wood (with no veneer) so I used Old Masters Gel Stain in Dark Walnut. This is where my love affair with this product began. 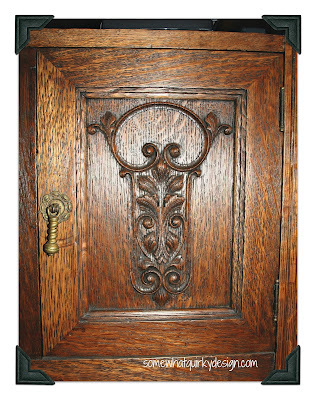 I used hand-rubbed poly both on the cabinet and the table. For the coffee table I built a box - MDF for the base and trim molding for the edges. I had a piece of 4 inch foam cut to fit inside the box. I covered the foam in upholstery fabric and added trim to both sides so it could be flipped when one side got dirty or trashed. I did a little accent painting on the legs. I hope everyone had a joyful and restful Easter. Tomorrow I'm going on a little road trip in search of Annie Sloan Chalk Paint and CeCe Caldwell paint. I've been saving my pennies and expect I will come home penniless. Then I will be ready to tackle all the projects I have stacked up around my garage and basement. I can't wait! My Mom used to antique everything! She preferred gold. I love your buffet/console. Hope you come home with a penny in your pocket tomorrow. Your post brought back memories from the 60's - my mother also painted a similar buffet olive green and "antiqued it"...we all kept telling her how gross it was, so she stripped it back to wood! I love what you did here - and very clever to get 2 pieces of furniture out of one! Well done! what a gorgeous piece! 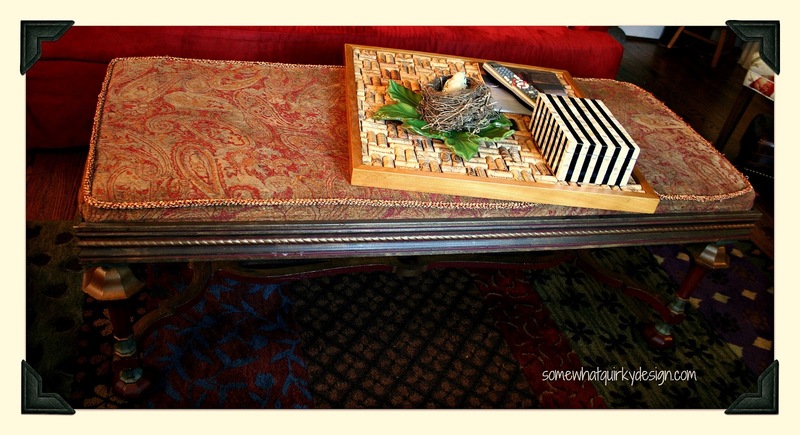 and i love the idea of a tufted top for the coffee table; you're so talented! Karen you have so many creative ideas. I love the accent coloring on the legs! You've been hard at work, but it has all paid off because you have two great pieces of furniture. 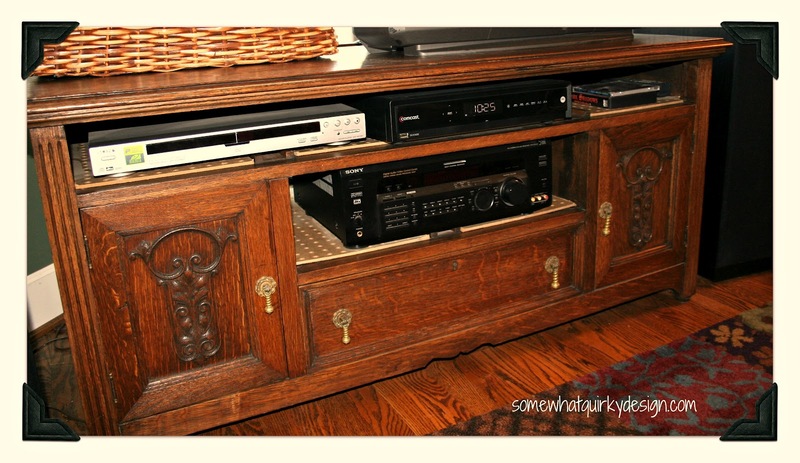 Your buffet is beautiful and it's perfect for your tv. I really love what you did with everything! I love the table and the console! So smart! Thanks for sharing with us! What a wonderful and creative way to upcycle an old piece of furniture! It looks like you've made it very functional for your home too. I love how nothing abut the piece is wasted since you'll be using the legs and drawers for another purpose. Thanks for stopping by my party this week! Perfect! 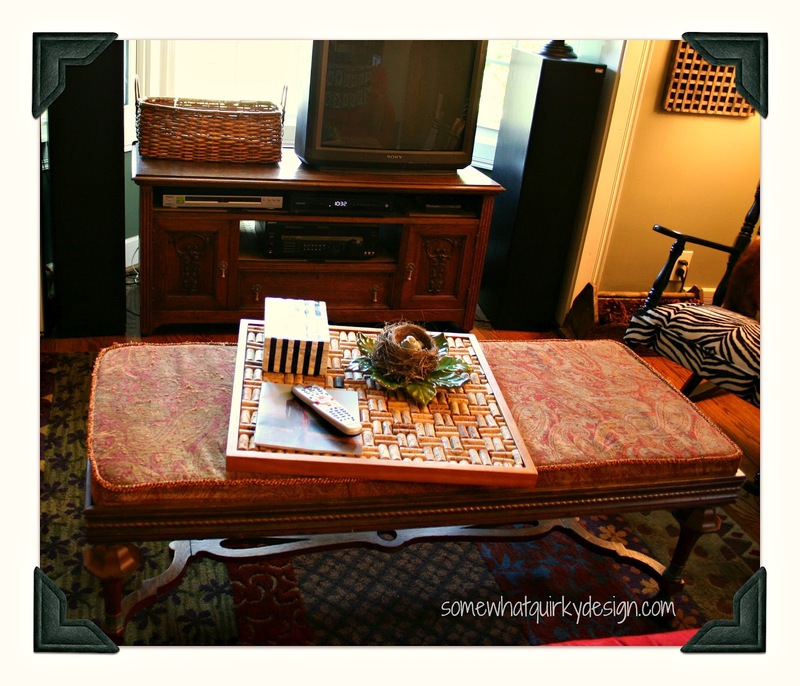 I am just finishing up "re-creating' a piece of furniture for our TV console. I wish I could have found a piece like yours that would work so perfectly! It's beautiful! 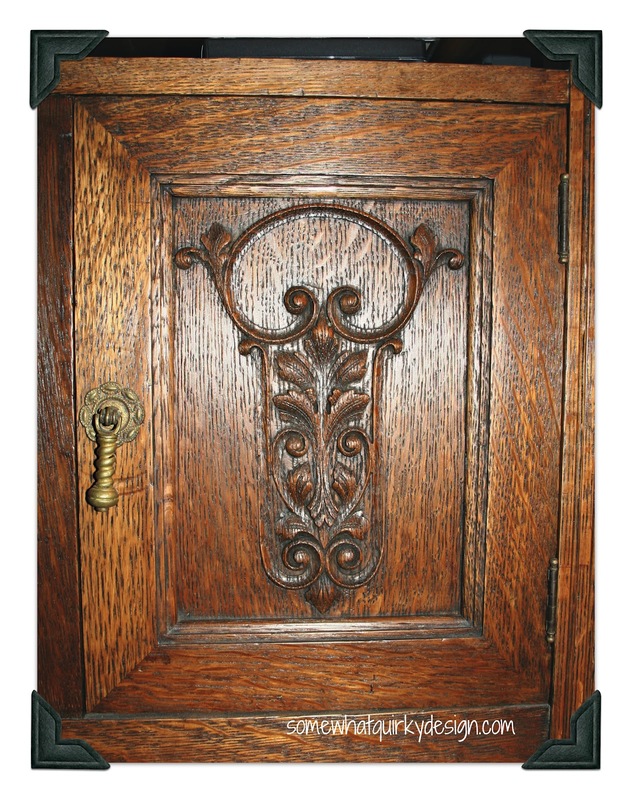 One of the beauties of solid wood pieces is that they can stand up to a number of transformations. The wood on your piece is just gorgeous.